Ferry Porsche and Karl Rabe stood in the doorway of the small workshop in Gmünd listening to the sound of distant thunder. Across the room, Ferdinand Porsche sat with his elbows propped on the edge of a work table, his chin resting on folded hands, and his bleary eyes closed tightly to block out the dismal image of allied bombers and far off battles. His thoughts began to drift back to better times, before Hitler—before the ugly war—to the days when he was the most sought after automotive engineer in all of Germany. He had no idea what the future held in store.On May 8, 1945 the war in Europe ended. 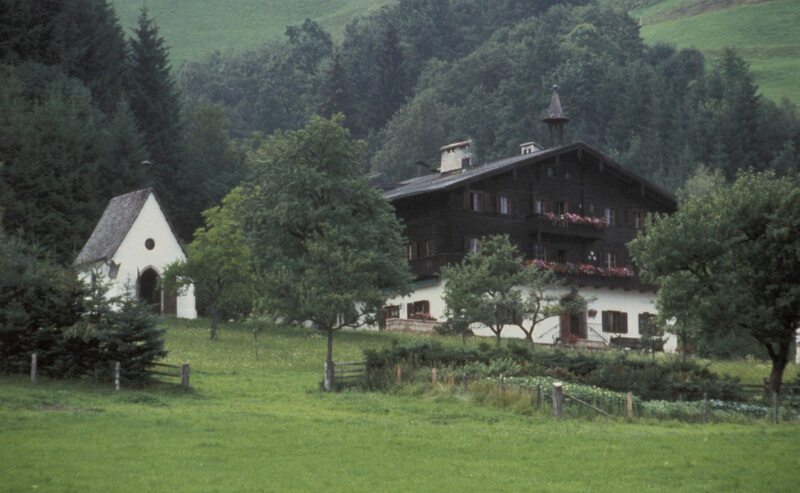 The Porsche family home in Zell am See, Austria, and the makeshift factory in Gmünd, where the Porsche werk had relocated, were occupied by American and British forces. To Ferry Porsche’s amazement one of the first U.S. soldiers to arrive at the Porsche house was driving a Volkswagen! Two officers arrived later in an American Jeep. Both of them knew his father. One was an English Lieutenant Colonel named G.C. Reeves, a former race driver who had followed Porsche’s success with the Auto Union race car before the war, the other an American Major named Torre Franzen, a former Chrysler engineer who had met Ferdinand Porsche on his first visit to the United States in 1936. Ferry was relieved by their arrival, but for the Porsche family the trials of war had just begun. After the war the main Porsche facility in Stuttgart-Zuffenhausen was appropriated by the French, and then turned over to the U.S. Army, which first used it as a transit camp for Russian prisoners of war awaiting repatriation and then as a repair facility for U.S. military trucks and Jeeps. Thus as the first year of the postwar era dawned Porsche was a company divided not only by the Americans and British, but also by two countries, Germany and Austria. With only the small makeshift factory in Gmünd at its disposal, Porsche KG would not regain use of the Zuffenhausen werk in Germany until the 1950s. After the Allied bombing of Stuttgart-Zu enhausen in 1943 Porsche KG moved its design and prototyping operations to a converted sawmill in Gmünd, Austria. Out of harm’s way, the Porsche design team worked throughout the remainder of the war in total secrecy. The photo was taken on May 20, 1944. As a country, Germany was facing a similar problem of division and ownership after the war. It was to be divided into the West German Federal Republic, still occupied by the Americans, British and French; and East Germany, which would remain under the control of the Russians. This separation and the indissoluble Soviet hold on East Germany was to keep the country divided until President Ronald Reagan uttered those unforgettable words, “Mr. Gorbachev, tear down that wall.” In 1989 the wall came down. Porsche had faired much better than most of its contemporaries during the war. Although the Americans occupied the Porsche factory in Zuffenhausen and the British controlled the VW factory in Wolfsburg, Porsche would be permitted to resume design work in Gmünd, Austria by the end of 1946. Ferry Porsche’s division of company assets during the war into three locations had proven to be a wise decision. The visit from the British and American officers had also been a pleasant surprise for the Porsche family. Such would not have been the case had the Russians or French come calling first. In fact, the U.S. stationed guards to protect the Porsche family house should either Russian or French officers and troops arrive to interrogate them. From drafting board to sheet metal, the evolution of the first Porsche-designed sports car, the Type 64 60K10, took about a year. The result was three examples of the higher-performance VW platform surrounded by Erwin Komenda’s streamliner body. 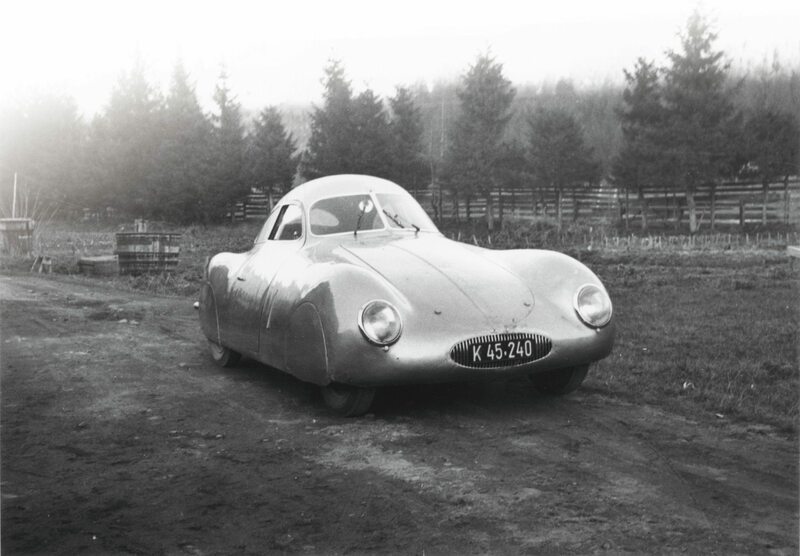 The contours that would become the Porsche 356 can be seen in this 1939 photo. The British command permitted Porsche’s chief engineer, Karl Rabe, to take charge of the small Porsche factory in Gmünd, which, due to its remote locale had remained undamaged throughout the war, as had two remaining Type 60K10 VW streamliners (predecessors to the first 356 Porsche) and a handful of VW prototypes that had been kept from harm’s way in Zell am Zee and at the small factory works in Gmünd. Unfortunately, not long after the occupation some American soldiers discovered one of the streamliners in a hangar at the Zell am See flight school. It was summer and the soldiers decided to make the aluminum-bodied aerodynamic coupe into a convertible with a pair metal cutters! Racing up and down the runway the car lasted only a few days because the soldiers had failed to check for oil in the engine, which ran dry and seized up. Now only one of the three Type 64 60K10 streamliners remained. That car is still in the possession of Porsche AG to the present day. The Porsche family was permitted to remain at their Zell am See estate, which was now under American jurisdiction. Ousted from the main house, being utilized for living quarters and as an operations center by the American military command, the Porsche family was forced to live on the property as best they could. Food, gasoline and diesel fuel were all in short supply. “Millions of our fellow countrymen were far worse off,” wrote Ferry, but a reversal of fortune soon awaited not only the Porsches but also the men who had worked at Gmünd during the war. The only surviving example of the Type 64 60K10 is now restored and part of the Porsche museum collection in Zuffenhausen. This is truly the very first Porsche sports car. The first incident occurred in the summer of 1945 when a German informer, who as Ferry wrote had “insinuated his way into favor with the British” became chief of police in Wolfsburg. Seeking to strengthen his political position, he accused Ferdinand Porsche of murder after two bodies were found in the house Porsche had used when visiting the KdF (Volkswagen) factory. The trumped up charges were unsubstantiated since no one from the Porsche family had been anywhere near Wolfsburg for several months. However, the police chief persisted, convincing the chief of the American military police in Zell am See that the Porsches were murderers. Ferry considered the accusations against his father preposterous until a unit of American MPs arrived and arrested every male member of the Porsche family. 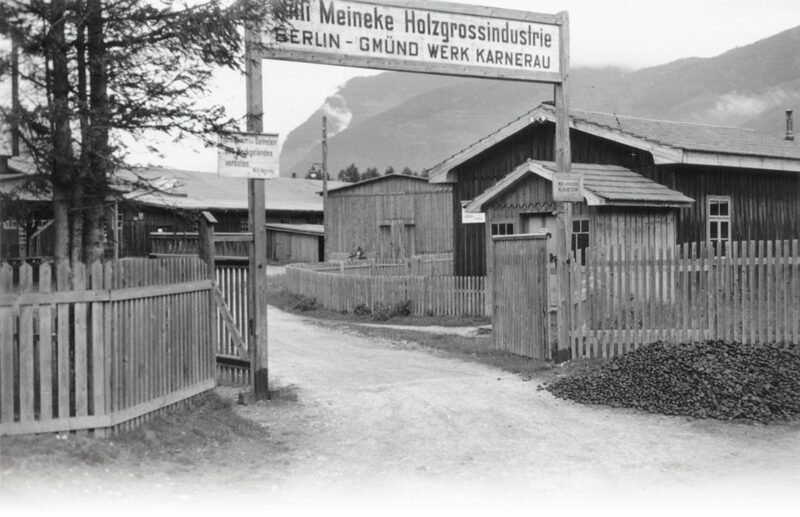 Erwin Komenda and most of the factory workers living on the grounds of the estate, 32 people in all, were taken into custody and carted off to a prison in Salzburg. Unbeknownst to any of the family members in Zell am See, Ferdinand Porsche had also been taken into custody, and was under house arrest at Gmünd until early August. He was then driven, in his own car, to Schloss Kransberg, a castle near Bad Nauheim that had been turned into an internment camp by the Occupation Forces. There, Porsche was kept along with senior members of the German ministry, including Albert Speer, Hitler’s Minister for Armaments and War Production. Everyone held at Schloss Kransberg was under suspicion of war crimes and it was here that the Allies would ascertain who would be sent to trial at the Nuremberg Court. Those sent to trial, including German Field Marshall Hermann Goring and 10 other Nazi party leaders, were sentenced to death in 1946. 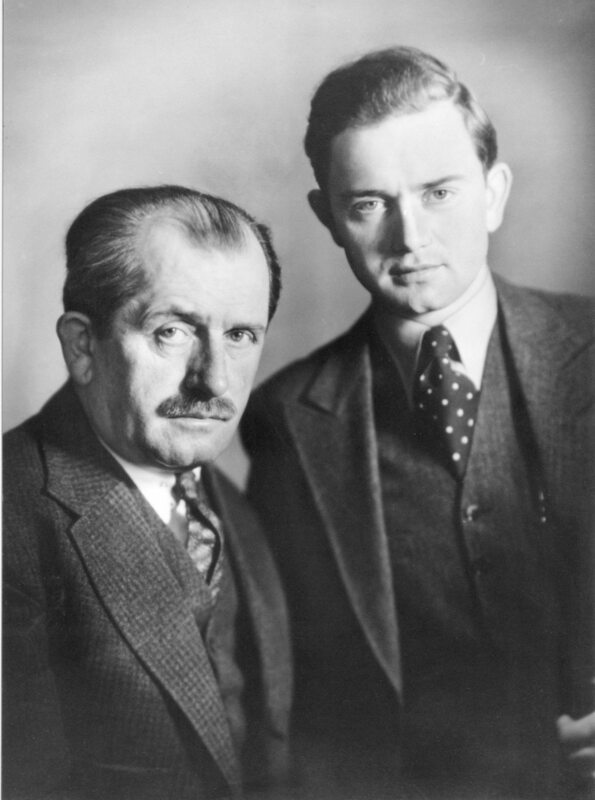 Pictured with his father in 1934, Ferry Porsche was learning every aspect of automotive design and engineering at his side. Over the next decade Ferry would become the driving force behind Porsche GmbH and lead the company from postwar ruin to international acclaim. Knowing that Porsche had not been involved in any political activity during the war, Speer strenuously defended him before the military tribunal. As a result, Porsche was cleared of any suspicion of complicity in war crimes and given an official document stating that no charges were to be brought against him. When he returned to Austria, shortly after his 70th birthday, only then did he discover that his son and all of his associates were in prison. Ironically, Ferry and the others had already spent 13 weeks in custody and not once had any of them been questioned about the incident in Wolfsburg! Recalled Ferry, “My father eventually succeeded in convincing the British of our innocence and he secured our release from the American military government in Vienna.” It was November 1, 1945 and when Ferry returned to Zell am See he believed that the worst was over. “We were to be proved hopelessly wrong,” he said. During the early postwar years, the Porsche family estate in Zell am See was occupied by the American command, however, the family was permitted to remain on the property. Totally restored today, it was here in the home he had known all his life that Ferry Porsche passed away on March 27, 1998 at age 88. This was about the time a young French Lieutenant named Henri LeComte arrived at the Porsche estate in Austria. “Lt. LeComte had first gone to our Zuffenhausen factory and discovered that we were living in Austria. LeComte claimed to be working on behalf of Marcel Paul, the French Minister for Industry,” wrote Ferry. “Paul was a member of the French Communist party. He wanted to obtain the Volkswagen factory as part of Germany’s reparations payments to France. Of course the agreement of the Americans and, more importantly, of the British, in whose zone the factory was, had to be obtained.” What the French needed even more was Ferdinand Porsche’s help, or so it first appeared when Lt. LeComte came knocking on Porsche’s door. At his bequest, in mid November Anton Piëch (Ferdinand Porsche’s son-in-law) and the Porsches, along with their cousin Herbert Kaes, drove to Baden-Baden, which was then in the French occupied zone of West Germany. There they met with government representatives at the Hotel Müller, who told them France was planning to build a state-owned automobile factory, which would include half of the manufacturing equipment from the VW plant in Wolfsburg as reparations payments. The Porsches were needed to supervise the removal and relocation of the Volkswagen tooling and to oversee construction of the new manufacturing facility in France. The French representatives, led by LeComte’s superiors, Major Trevoux, and Major Maiffre, had gone so far as to draft a contract in advance for Ferdinand Porsche to sign, and Trevoux requested that he do so before leaving! Although the plan appeared to have some merit, and had obviously piqued Porsche’s curiosity, he hesitated to sign, telling Trevoux that he needed to think it over before agreeing to the proposal. 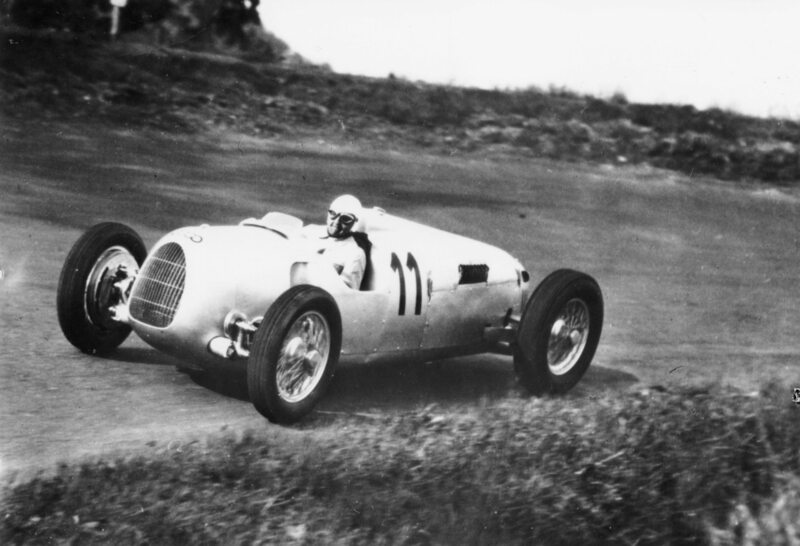 Porsche had created something entirely new with the Auto Union racecar. Not only a challenger to Mercedes-Benz but to the world of motor racing. The forward cabin seating position is clearly shown in this view. With the engine mounted behind the driver, the car’s weight distribution and handling characteristics were unique. The car is seen here at the Nürburgring with driver Ernst von Delius in June 1936. Back in Zell am See Ferry expressed serious doubts regarding Marcel Paul’s plan and the sincerity of the French to build a German car, but his father had become enthusiastic about the project in the weeks that followed and told Ferry, “It looks like the French are pretty serious about this business!” Early in December the Porsches, Piëch, and Kaes once again made the drive to Baden-Baden to resume discussions with Trevoux. They had no idea that the political situation had changed between November and December, and that they were now walking into a trap. The French accommodated the Porsches in the Villa Bella Vista and a meeting was arranged again at the Hotel Müller, however, when they arrived Trevoux was not there. In his place was a Colonel Lamis, who showed little interest in the discussions and asked seemingly irrelevant questions of Ferdinand Porsche. The meeting concluded rather abruptly and the Porsches were sent back to their rooms. “My father gradually became more and more impatient,” recalled Ferry, “and decided to go back to Zell am See the next day. That same evening, Maiffre and LeComte were dining with us when two Frenchmen in civilian clothes suddenly appeared and told us that we were under arrest. LeComte acted surprised and said, ‘The whole thing is a misunderstanding, believe me! Please remain calm and don’t get excited, we’ll have the matter cleared up by Monday!’” Monday would be too late. The order had come from the French Minister of Justice, Monsieur Teitgen, and on Sunday, December 16, 1945 Ferdinand and Ferry Porsche, and Dr. Anton Piëch were taken to the prison in Baden-Baden. Kaes, who had decided to skip the dinner on Friday and go to the cinema, escaped arrest. Staying at the house of a relative, he remained nearby to observe the events as they unfolded. 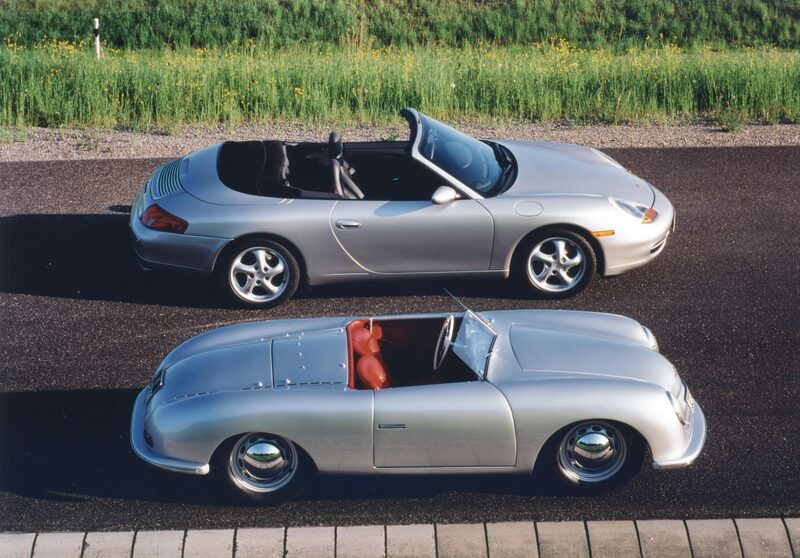 56 years of design and engineering, yet the 1948 Gmünd Roadster and 996 Carrera Cabriolet bear an unmistakable resemblance. The Porsches had been imprisoned now for the second time in as many months. Knowing of the document clearing his father of any war crimes, Ferry was at a loss for their unprovoked arrest. His answer came the next day when a series of charges were leveled at his father and brother-in-law, this time for misconduct with respect to prisoners of war and workers at the Peugeot plants which had come under the control of VW during Germany’s occupation of France. The rationale was that Ferdinand Porsche and Anton Piëch had been in charge of the KdF Werk during the war, thus they were responsible for the acts of the Gestapo who had brutalized French workers. The accusations were as thin as the paper upon which they were written. 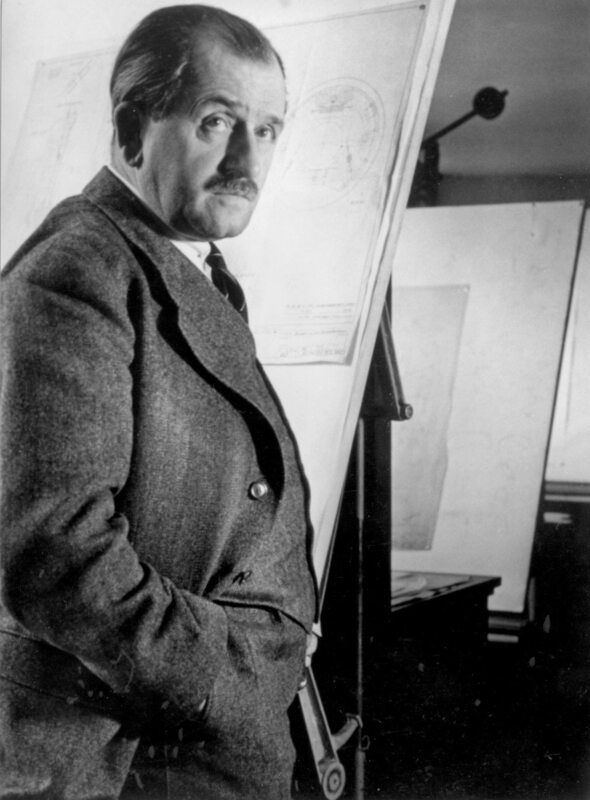 The Porsches and Piëch had merely become pawns in a battle between two factions, and their arrest part of a politically motivated conspiracy by French automakers and those within the French Cabinet to sabotage Marcel Paul’s plan of building VWs in France. Ferry’s early apprehensions about the sincerity of the French had been correct. “They had hoped to achieve their aim by taking us out of circulation,” he said. And it had worked. The accusations, false or otherwise, were far more serious than they first appeared. It was soon proven that Ferry had never been associated with the management of the KdF Werk and he was released from Baden-Baden prison in March 1946. However, he was not permitted to return to Austria until July. Ferdinand Porsche and Anton Piëch had also been released from prison but were likewise detained as “guests” of the French. Despite protests from within the French Cabinet, Marcel Paul continued to lobby for the production of a VW in France, and thus the struggle raged on into 1946. In May both Porsche and Piëch were driven to Paris where they were accommodated in the servants’ quarters of the Renault villa. They were later met by a team of Renault engineers and asked to review drawings for the new 4CV model, and to assist Renault in the set up of the production line. Porsche and Piëch cooperated fully and even worked in the Renault assembly shop on preparations for the production of the 4CV, yet after more than a year and repeated pleas for their release, in February 1947 they were instead returned to prison. Events had suddenly gone from bad to worse. By the late 1930s Porsche’s counsel was being sought by Germany’s leading automakers and his fortunes were about to change with development of the car he had longed to build since the 1920s, a small, affordable automobile that would come to be known as the “People’s Car”, the Volkswagen. Marcel Paul had lost his seat in the French Cabinet, thus ending the debate over producing the VW in France, and Minister of Justice Teitgen, who signed the original arrest warrant, had become even more powerful within the cabinet. Perhaps as a result, Porsche and Piëch were transferred to the prison in Dijon, one of the worst in France. The cells were unheated even in the depths of winter, and at age 72 the elder Porsche’s health soon began to fail. A physician declared him too ill to remain incarcerated and Porsche was transferred to the prison hospital where he slowly regained some strength but remained in despair over his situation. Several months later Porsche was interrogated once again by French authorities, only this time there were two Peugeot factory managers present, both of whom spoke on Porsche’s behalf, confirming that he had had nothing to do with the mistreatment of French workers. A former Gestapo officer had also been questioned and he too confirmed that Porsche had absolutely no involvement with French prisoners being sent to Germany, as forced labor at the KdF. Ferdinand Porsche’s long winter appeared to be coming to an end. With these new revelations the French finally agreed to free both Professor Porsche and Dr. Piëch, but first a bail of one million francs was to be posted, an impossible sum of money for the Porsche family to obtain. In Part 2, the postwar resurrection of Porsche and the birth of the 356.